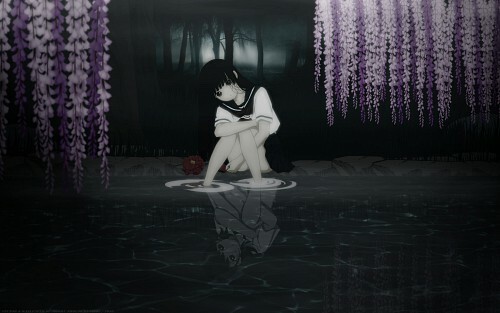 Jigoku Shoujo Wallpaper: Not really alone? Minitokyo »	Jigoku Shoujo Wallpapers » Jigoku Shoujo Wallpaper: Not really alone? Thanks to Madlax-X-Mireille for this wonderful scan (found on AP)! I vectored separatly each elements (10-12 hours), and I tried making something dark and mysterious. I especially worked on BG and lightning, dominant color to do it. prettye wallpaper, love it so much! lovely, you really have a unique vectoring style that when i see your wall, i immediately know it's you..
see some light coming in from above the water should have more of a shine on it. touch but I think it would've served more purpose in the water. This wallpaper is good and I like the gray tones but the red scary glowing eyes are missing, in my opinion. saw in AP and faved it there as well. nice wallpaper ... Thanks for share ! really good vectoring. I wish I can do that too. Wow really nice wallpaper Ai the vector is amazingly intriguing to look at and its setup is just great. I give you A+ for a grade on this wallpaper and definitely thanks for sharing. happy halloween and thanks for this wall! I like to download it now ^ ^.